Lewes prides itself on being different and, despite being in the prosperous Home Counties, it is over 20 years since it last elected a Conservative M.P. However, for more than a century, from 1874 to 1997, it was represented by seven successive long-serving Tories, sandwiched between the Liberal Lord Pelham and the Liberal Democrat Norman Baker. At first inspection these seven Tories seem a rather typecast group – privately-educated, well-heeled and well-connected country gentlemen with Oxbridge or military backgrounds. Without exception, they appear establishment figures. Peer a little closer and the homogeneity disappears, allowing the individual characters to emerge. Some had real accomplishments to their credit, though none achieved high office. It may not have helped that several were hardly Tories at all in their political beliefs. One was a direct descendant of Earl Grey (of the tea) and another of Nell Gwynne. Yet another was the godfather, and the early political patron, of a Prime Minister whose name you will recognise. 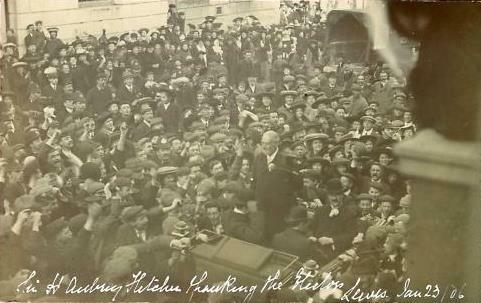 Before TV, election results were announced in public, outdoors, in front of County Hall. Note the high proportion of women, ineligible for the vote until 1918, amongst those gathered to hear the outcome. 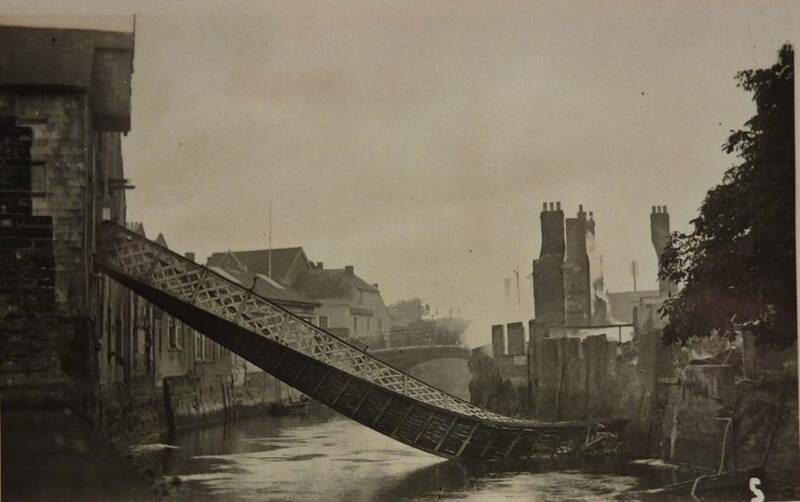 This view taken after the fire at the Bear Hotel shows the twisted footbridge collapsed into the river. This view of Cliffe High Street, published by Boots Cash Chemists, is postmarked 1907. 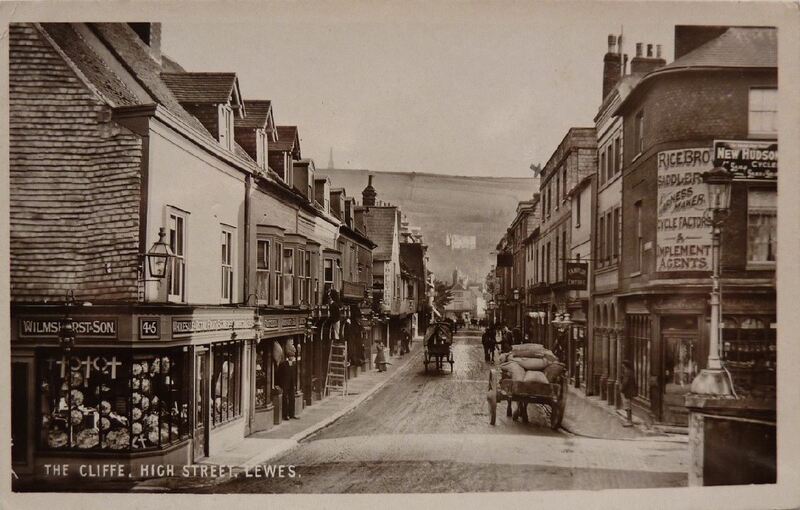 Both postcards are from Tony Durrant’s Lewes post card collection, which he is dispersing. The directory shows all the usual trades one would expect in a busy market town, many of them with multiple competing suppliers. There were however, amongst the butchers, bakers, grocers, solicitors, doctors and dentists, some more unusual businesses, a sample of which are below. Martin Joseph, town carter & general dealer, 9 Waterloo pl. The local newspaper reported the results of a number of local football matches. The Lewes Ramblers had played a hard fought nil-nil draw against the Phoenix Ironworks, though the referee’s decisions had given rise to some unpleasantness. However, the Southover Stars had beaten the Cliffe Stragglers 9-0. Both matches had been played on the Race Hill on the previous Saturday. In another match at Floods Bottom J. Smith’s XI had beaten Commercial Square 3-0. All the teams played in the traditional 2-3-5 formation. The 1934 local directory called ‘Pike’s Blue Book’ notes that Lewes then had a museum, under the auspices of the Lewes Scientific and Literary Society. It was located in the Old Council Chamber, in the Market Tower, and had a collection of Sussex birds, comprising over 600 species, and other natural history exhibits. It was open to the public, free of charge, on Mondays and Fridays from 11 am to 1 pm and 2.30 pm to 4 pm, and also during the autumn and winter on Monday evenings from 6.15 to 7.45 pm. The Hon. Sec. was Mr E.J. Bedford. The 2014 volume of Sussex Archaeological Society’s SAC has just been circulated to members, and includes two articles directly relevant to Lewes history. To mark the 750th anniversary of the Battle of Lewes there is a major new article by David Carpenter and Christopher Whittick. It is published as vol.152, pp.39-65. This updates David Carpenter’s 1987 interpretation to include the most recent research and discoveries, about both the battle itself and the role it played in the 13th century political settlement. The second Lewes article is by Frances Stenlake, the speaker at our February 2013 meeting, and is titled: ‘The lady fired splendidly: Lewes and the Women’s Suffrage campaign’. It is published as vol.152, pp.139-152. Frances notes that Lewes was not in the forefront of either the Suffragist or Suffragette movements, though some activists of both genders were imprisoned in Lewes Prison and suffragettes appeared not infrequently as Bonfire effigies. This entry was posted in Economic History, Lewes, Local History, Political History, Social History. Bookmark the permalink.